Free Shipping Included! 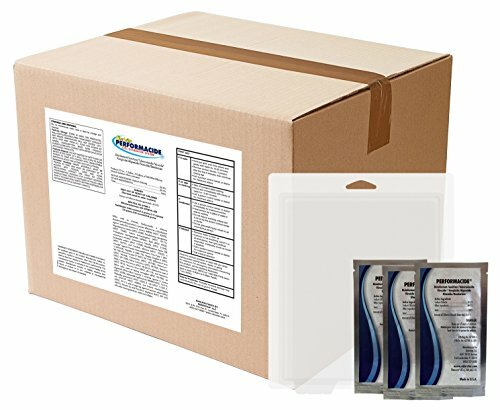 Performacide 102003-24 Disinfectant for Hard Non-Porous Surfaces, Gallon Pro Pack (Pack of 24) by Performacide at In The National Interest. MPN: 102003-24. Hurry! Limited time offer. Offer valid only while supplies last. Performacide Hard Surface Disinfectant is for use on hard, non-porous surfaces as a Disinfectant, Sanitizer, Tuberculocide, Slimicide and Deodorizer. Performacide Hard Surface Disinfectant is for use on hard, non-porous surfaces as a Disinfectant, Sanitizer, Tuberculocide, Slimicide and Deodorizer. As a disinfectant Performacide kills MRSA, Staphylococcus aureus, Listeria, Trichophyton mentagrophytes (athletes foot), Enterococcus faecalis, Salmonella, TB. As a Virucide, Performacide kills HIV-1, Hepatitis A, Herpes Simplex-2, Rhinovirus, Influenza-A, Coronavirus, Rhinovirus, Canine Parvovirus, feline calicivirus and Vaccinia virus. Performacide kills odor causing bacteria mold & mildew. Performacide EPA Reg. No. 87508-3 is registered for use in hospitals, medical laboratories, rehabilitation facilities, diagnostic centers, clinics, first responder facilities, medical equipment, pharmaceutical facilities and laboratories. Performacide uses a pre-measured pouch that when immersed in the corresponding amount of water creates a 100 ppm chlorine dioxide solution. Allow the pouch 60 minutes to reach full activation and the 100 ppm ClO2 solution lasts 15 days when stored in an oxidation-proof, dark closed or sealed container in a cool dark location. Using EPA label directions, Performacide can be diluted to 20 ppm for use as a sanitizer on non-food contact surfaces and 5 ppm for use as a sanitizer on food contact surfaces. For disinfecting, wet the area to be treated with a mop,, sponge, or pressurized tank sprayer and allow to air dry. This product can be applied to walls, floors, furniture, stainless steel, glass, vinyl, or other hard non-porous surfaces. For sanitizing hard non-porous, food contact surfaces dilute to 5 ppm and allow 5 minutes of exposure time. For sanitizing hard non-porous, non-food contact surfaces dilute solution to 20 ppm and allow 5 minutes of exposure time. Please see inner label instructions for dilution tables and ratios. To test activated solutions after storage or dilution use chlorine dioxide test strips for concentrations with a range of 0 ppm up to 500 ppm. If you have any questions about this product by Performacide, contact us by completing and submitting the form below. If you are looking for a specif part number, please include it with your message.